With news full of reports about the fraudulent dossier used to obtain the FISA warrant to intercept communications of Carter Paige and the release of the memo last week, the following is provided to UTT readers to help them understand what it takes to obtain a FISA warrant, that FISA is constitutional, and that FISA is needed for the national security of America. The FISA Court provides a means for the U.S. government to collect on subjects of sensitive/classified investigations (counterintelligence and terrorism for example) without endangering sources and means of the investigation. FISA judges are federal judges who have been confirmed by the U.S. Senate and chosen by the Chief Justice of the U.S. Supreme Court. Understanding the Threat’s President John Guandolo served as a Supervisor in the Counterterrorism Division at FBI Headquarters during his career in the FBI. In that capacity, he was the affiant – one who swears to the veracity of an affidavit – in support of numerous FISA warrants. When an FBI agent in the field needs a FISA warrant, he/she contacts their supervisor at FBI headquarters who acts as the affiant for the warrant. The two work through the affidavit, sometimes over 100 pages long, until the FBIHQ Supervisor is satisfied the legal standard of Probable Cause is met and the facts are verified. The FBIHQ supervisor works with a Department of Justice attorney, and the cover sheet for the affidavit must be signed off by a DOJ official. The affidavit is also reviewed and signed off by the FBI Director or Deputy Director. It is not unusual for the FBI supervisor and DOJ attorney to meet with the FBI Director over a weekend at his home while the Director reviews the affidavit, asks questions, and is satisfied the affidavit can go to the judge. Then the FBI supervisor and DOJ attorney sit before the FISA judge who reads the affidavit and asks questions. When the judge signs the affidavit, the technical process begins to intercept the subject of the investigation. This entire process is legal, constitutional and an important tool in the national security toolbox for dedicated servants inside the government. In the current case before us, FBI and Department of Justice leaders put forth an affidavit that – as the memo released last week makes clear – was fraudulent and the FBI knew it. The dossier from Christopher Steele was fabricated and purchased by Hillary Clinton/DNC, and yet this information was not provided to the FISA judge during the initial application for the FISA warrant nor at any of the three times when the warrant was renewed. In a vacuum, these actions are violations of federal law. At a minimum, this is perjury and tampering with a federal election by those involved. Robert Mueller’s investigation was predicated on a request for Special Counsel which did not allege any crime. The FISA warrant for Paige was predicated on lies using a source known by the FBI to lack credibility (Steele). Wow. I am very happy and impressed with the lengthy article and all the hard work you are doing to expose all the illegal actions done by the democratic party. Sedition and how about treason also. 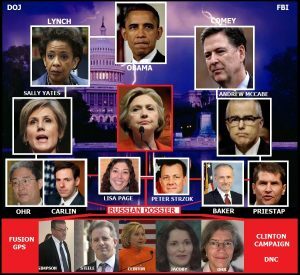 I pray to Jesus Christ that all these people are brought to justice for crimes they committed and are gone asap from our government. Thank you John. keep up all the good work. I pray for your safety and your boldness to continue. Thank you, John, for breaking down these complex components into more understandable points. Often things like this transpire because the perpetrators are confident few people will be bothered to connect the dots, so the in the tank media can spin things. It’s vital we connect these dots! One question: I’m not sure how sedition is different from treason? Hillary winning the election was such a “slam dunk,” nobody thought anybody had to be careful. Unfortunately for them, Hillary was squashed and all of these dirty dealings by certain members of our DOJ and FBI have come to light. If these actions aren’t met with the full force of the law, then there is no such thing as law. Martha Stewart and Scooter Libby went to prison for a whole lot less. In fact, Watergate was a whole lot less. Time to pay up, folks. 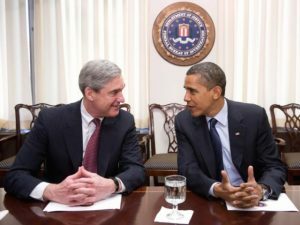 I haven’t heard of anyone calling for the demise of FISA, but as you said, it should only be used ” for dedicated servants inside the government.” This cabal of Obama slimes at the top of the FBI and DOJ hardly fit that description! Furthermore then, with respect to “seditious” intent under-color-of-law; the collective actions of said former nineteen-member cabal of sub-rosa political-criminals (pictured above), who with obvious malice aforethought involving, among other nefarious scams, false pretenses, counterfeiting, usurpation of the U.S Presidency and Congressional-oversight malfeasance, successfully wormed their way into diverse positions of federal power to carry-out not only a self-serving overthrow of the duly elected President of the United States, but to engage as well in an historic perjurious assault on the foundational core of the U.S. Judiciary Branch of American governance — the “TRUTH”, I.e., by successfully deceiving the eleven U.S. federal judges of the “Foreign Intelligence and Surveillance Court” (FISC), who they encountered perforce multiple times into believing that the criminally contrived documented bodies of pornographic filth they were being asked to review represented legal justification for their (contextually) sacred and trusting approval. Parenthetically, in view of the fact that thus far three successive Directors of the FBI (Mueller, Comey, and recently, Wray) have been unable — or inexplicably unwilling (by virtue of maintaining a severe reduction in the number of Special Agents exclusively assigned to the case — to determine the identity of the perpetrator of the homicide of Assistant United States Attorney Thomas Wales in Seattle, on 11 October 2001. which given the storied reputation of the FBI is tantamount to asserting that the Pope has forgotten the words to the Lords Prayer. Actually, in the “for-what-its-worth” context of police work-101, perhaps they should stop looking for Makarov semiautomatic ersatz gun barrels and consider the possibility, e.g., that AUSA Wales may have been murdered for adamantly refusing to shut-down an investigation involving a combination of high-ranking U.S. political figures and contraband drugs. Who knows, considering that “TRUTH” is stranger than fiction, and more to the point, “Evil hides in the mind, not on the face”, they have nothing to lose; or have they?